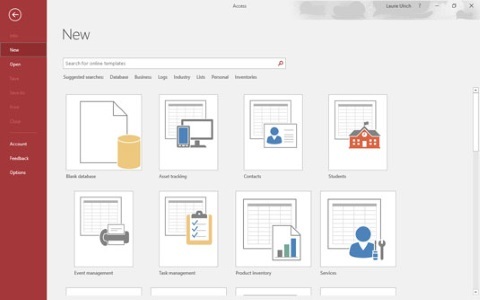 If you're upgrading to Access (or Office) 2019 from the 2013 or 2016 interface, you'll find it looks very familiar — and you'll find much of it to be the same as what you're accustomed to. Let's start with the File tab, where a vertical list of commands creates context-sensitive changes to the main workspace — essentially everything to the right of that left-hand menu panel. • To start a new database, click the word New in the File tab's vertical menu of options. 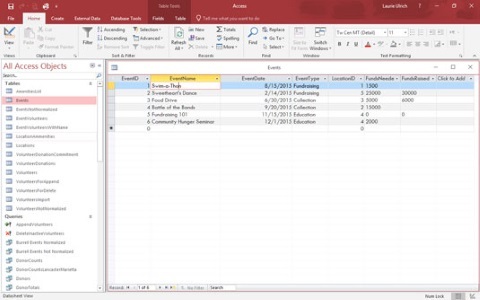 Starter templates appear along with the Blank Desktop Database button. Most of the time, you'll be clicking the Blank Desktop Database button so you can create a completely customized database. • If you've opened an existing database, click the Info command (as shown) to get important statistics related to the open database. Two big buttons and a link appear, from which you can Compact & Repair the database files, Encrypt the open database with a password, or see the Properties for the open database by clicking the View and Edit Database Properties link. • The Save, Save As, Print, and Options commands each lead to either more command choices or a dialog box. For example, choosing Save As produces two options — to save the open database with a new name (Save Database As) or to save a new version of the active database object (Save Object As), which allows you to save the table, form, query, or report you have open at the time with a new name. So you're ready to dive in. Well done, you! It's easy to start Access. You can start the application in multiple ways, accommodating nearly any situation you're in. Whether you're starting Access to view and edit an existing Access database (which gives you what you see here) or are about to create your own (which opens the application and displays the template icons, shown in the second figure), you can get to the tools you need right away. This first figure shows an existing database open to one of its tables; its other components are listed on the left side of the workspace.